MIAMI BEACH — What’s in a name? Aspiration, mostly, at least as far as art fairs are concerned. The fourth edition of Untitled Art Fair opened here last night, and past the architectural fuchsia cutout that marks the beachfront tent’s entrance it was apparent that this was a fair with institutional airs. Visitors were greeted by a formation of nine toddler-height chevrons by Ronald Bladen (“Chevrons,” 1974), an angular introduction to the fair’s “curated” special projects section, with works and wall texts scattered about the entrance area. Those works were culled from exhibiting galleries — the Bladen piece came from Loretta Howard — and they were selected by a curatorial team consisting of Melanie Scarciglia, Christophe Boutin, and Untitled artistic director Omar López-Chahoud. Artists have been providing auratic assists to fair VIP lounges for some time, but Untitled’s “Toiletpaper Lounge,” the product of a collaboration between Maurizio Cattelan and Pierpaolo Ferrari, takes the trope to a new level: The pair delivered a maximalist kitsch hell, pink-walled and carpet-bombed (there are many rugs for sale). All grandstanding aside, Untitled does live up to its institutional aspirations in some more concrete ways, with a good number of nonprofit and museum booths, and the 127 participating galleries are a strong mix, one that avoids leaning on what one dealer characterized as the “market darlings” that dominate the action at other satellite fairs. From Casa Mauuad, a residency in Mexico City that brought a charming stack of resident editions, to Imperfect Articles of Chicago, hawking 25 artist-designed shirts including gems by Michelle Grabner and Trenton Doyle Hancock, the liveliest precincts of yesterday’s preview attested that marquee names and elaborate commissions are not necessarily the key to building enthusiasm at art fairs. At the Bronx Museum’s booth, exhibitions and collection manager Heather Reyes told me that “The Cell” — the micro-show of Cuban contemporary art — represents the first time that objects from their permanent collection have shown at an art fair. Though museums have certainly shown at some fairs before, this is an unusual first, all the more interesting since it arrives at a time of heated commercial interest in Cuban art. Like many of its peers from the nonprofit sector at Untitled, the Bronx Museum was selling multiples alongside its curated show: three works by Derrick Adams, Brie Ruais, and Humberto Díaz. At Mexico’s Marso gallery, internationalism was traded for science, and three photographs from Sarah Schönfeld’s Internet-ready chemical reaction photograms were straddled by cerebral work by Andrea Galvani and Luis Felipe Ortega. Galvani presented a disarticulated wall-mounted montage of images related to the historical and astronomical genealogy of Galileo’s heliocentric model of the universe, a recurring preoccupation of his, while Ortega showed “Doble Exposición,” a set of images, recalling DNA sequencing, manipulated from Peter Fischli and David Weiss’s eponymous 1999 book. Further congress with the natural world could be achieved on an entirely different register at Fredericks and Freiser, which showed four works by the Pop-adjacent artist John Wesley, including three utterly arresting smaller acrylics on paper from 1979. The three works, titled “Ocean” 1, 2, and 3, depicted pared down ocean landscapes of cloud, cliff, rain, and waves, quietly charismatic pictures that seemed to meet Hokusai and Hergé halfway. 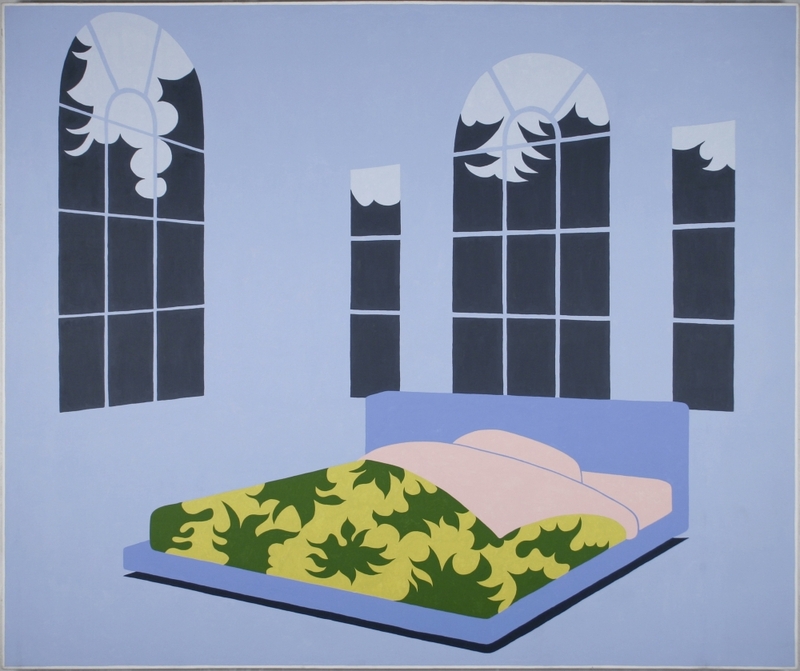 The fourth, “Untitled,” 1987, is a larger painting of an empty bedroom, a cleanly minimalist work that manages to offer up hints of cut-out Matisse in the warm decorative pattern on the bed and the austere foliage dangling in the windows. At Loretta Howard, home of the entryway chevrons, a sort of meta-restaging unfolded in “Where Sculpture and Dance Meet: Minimalism from 1961 to 1979.” The booth revisited an exhibition staged earlier this fall by the Chelsea gallery, which was itself a sort of restaging of the dynamics between dance and art in the minimalism of the 1960s and ’70s. The exhibition concept responds to a trend at museums toward restaging works from this period, an inclination thoughtfully denounced by the art historian and critic Hal Foster in his recent book, “Bad New Days”: “Not quite live, not quite dead, these re-enactments have introduced a zombie time into these institutions.” But it’s always zombie o’clock at the art fair, and I found the booth, complete with a few of Andy Warhol’s helium-filled “Silver Clouds,” 1966 — on loan from the Andy Warhol Museum — to offer just the sort of charmingly irrelevant anachronism needed to deflate an art fair’s pretensions to a state beyond commerce. Untitled continues through December 6.